Aftermath casts you as a survivor in a post apocalypse wasteland. As it starts you’ve stumbled on the, seemingly deserted, remains of an outpost of some sort. Do what you can to survive and move on. “Aftermath is a single bsp episode which will take from 10 to 30 minutes to complete, depending on how easy you find the puzzles. The level is really an attempt to try two things: Firstly, to see just how much detail you can get into a level before running out of brushes (as a result it may run badly on slower machines). 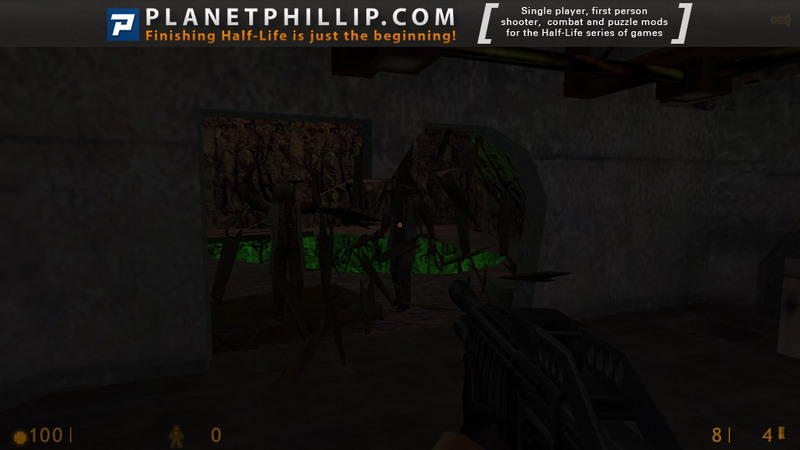 Copy Aftermath.bsp into your Half-Life 1 Maps folder. 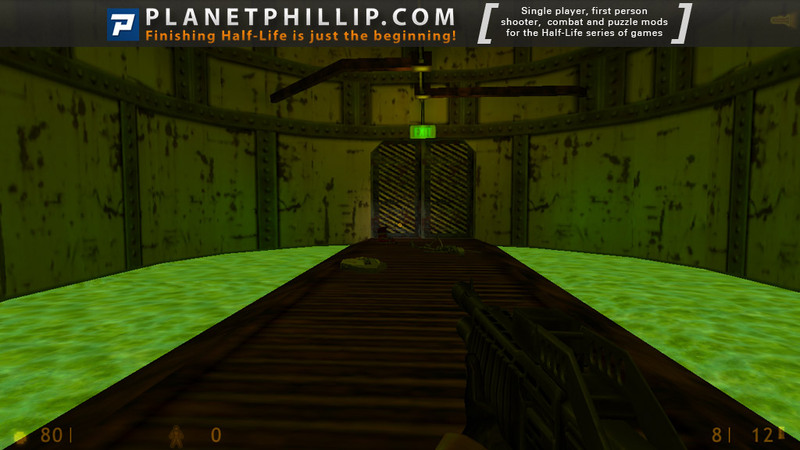 Copy Aftermath.nod into your Half-Life 1 Maps/Graphs folder. Open the console and type map Aftermath. A short survival horror style map with a creepy atmosphere. The map isn’t exactly hard as you get powerful weapons at the start to fight the zombies throughout the map, however there is plenty of ammo and health around too. Most areas are filled with zombies and a few headcrabs which are easy to pick off with one or two shotgun blasts to the head. A few respawns here and there to add more action as you progress furthur, and the puzzles are very easy too. The thunderstorm in the background adds to the theme well and the map also uses a few sound effects and music tracks to spice it up a bit more. Very solid above average design with well chosen textures that match and fit well together, esepcially within the theme, and each is aligned very well. Structure isn’ï¿½t too special, except for a few small constructions here and there andt he lighting is kept at a fair level without being too dark. Short, fun yet very easy and a solid design throughout. 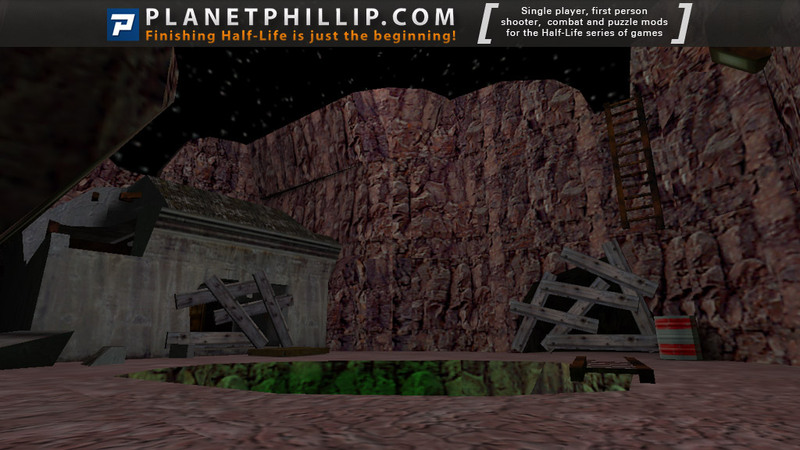 This is a small set piece made by Stuart Maine (Other release Assassin Mark 2). On his site Stuart says : ” I’ve tried to do two things: Firstl, to see just how much detail you can get into a level before running out of brushes. Second, I wanted to try create a spooky horror atmosphere, without using any new texture, sound, model,…” In regards with what he told us, he did succeed. In my opinion this is the first time that a stand alone map really catches my attention, with a particular ambience like in Neil Manke’s They Hunger Add-on. You travel trough an abandoned chemical base (on a dark covered evening with thunder lights), where you encountered the ” living dead” (zombies and headcrabs), the weapon possibility is also limited (which is good), finally the puzzles to get through are quite simple but not always evident. Mission objective is the mostly use in sp mapping: make your way trough and find the exit. You are travelling in a military complex (sort of) with in some place embushes. Progression is mostly linear in a quite repetitive environment. The design make it more look like an unfinished subway with multiple blocked way by gravels or locked door. Architecture is quite repetitive and only indoor, it doesn’t look always true. Gameplay is mostly streight forward with some small puzzles (start and progression over a gravel heap in the low foor) combats are well spread but under challenging with the rifle+scope (only weapon given). Ending appears after the second screen when you open the door. A short experience that create an unique atmosphere only by using original texture and feature. …and yet another flawed and failed installation. Shawn, I’m not exactly sure what problems you seem to be having with your installations. Please refer to the reply I left you on your post of A Day in the Life of a Coward. For this one in particular, yes there are numerous folders within folders of the zip file but what you need to look for are the core files which consists of the *.bsp file & the *.nod file. It’s quite simple after you do it the first few times. 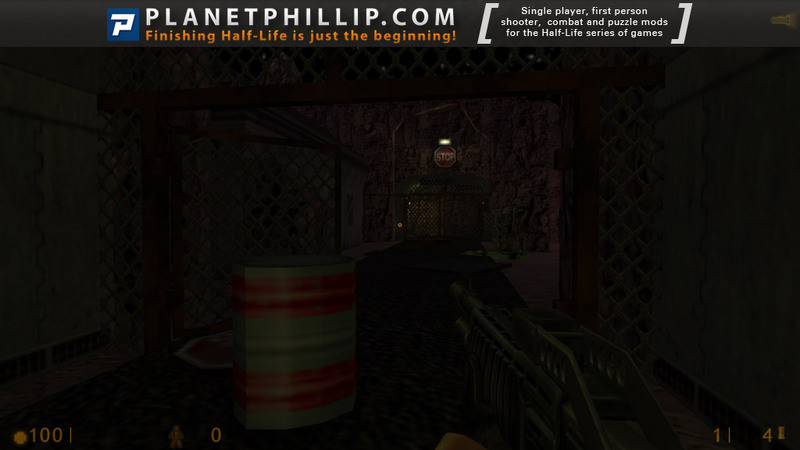 The *.bsp file goes into your valve\maps folder & the *.nod file goes into your graphs folder. The readme file of this one is pretty exact in what you should do so I don’t understand why you’re having problems. If I had the means, I would most definitely do a video tutorial of how to do this because I feel it’s really a basic but extremely important necessity to recieve the full optimization of one’s gaming experience. The authors aims have been reached. Good detailed textures and a spooky, almost dark atmosphere only lit by lightning flashes in a very well constructed environment. A dark journey round the map, finding switches to gain access to more switches to find the exit. Weapons are shotgun, colt 45 and crossbow. Enemies are zombies and headcrabs, and the dark. A fun little mod, with a creepy atmosphere to boot. You’re given a limited selection of weapons, and have to solve a few puzzles to reach the end. Due to the short length, abundance of ammunition, and enemy respawns, I recommend trying to run through this map as quickly as you can. It’s more fun that way. 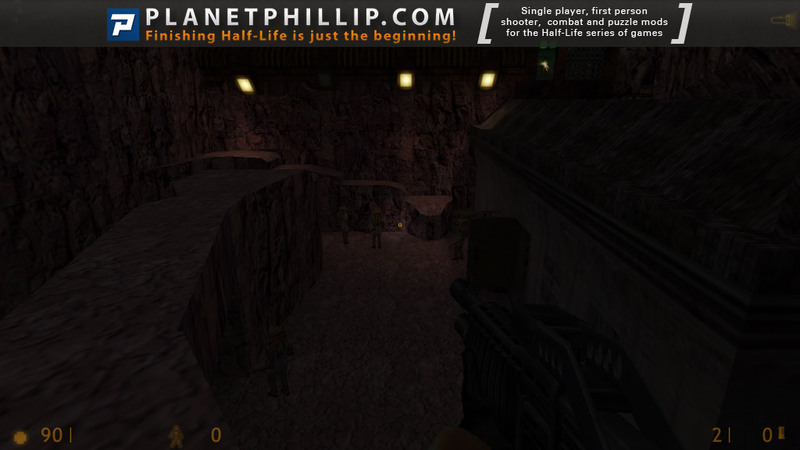 This small map does what its author set out to do: create a small, atmospheric setting, with limited enemies but tight gameplay. 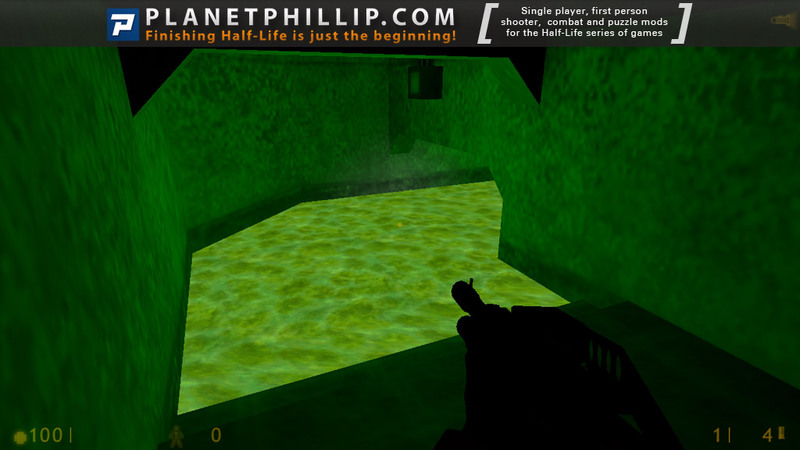 The map is mainly lit from the radioactive vents/holes found around the place. I found it quite fun to play but was a little annoyed I didn’t have/find the crowbar, which in cases like this is enough. The addition of the crossbow and magnum were probably overkill, considering the amount and type of enemies attacking you. I had to reply the ending twice because I thought it had crashed, so expecting not only a strange ending but a short mod. It took me about 15 minutes to play through. It was quite fun but I have only given it a MAYBE recommendation because I feel that it’s appeal is quite limited. I would have given this a PiL but the ending ruined it for me. In a nutshell this map requires you to search the area and look for the exit while killing Zombies and Headcrabs and also solving puzzles to get there. The action and puzzles were both very easy however. The atmosphere of this mod was the stand out section and was really well done in my opinion. I was stuck at the end because I had killed all the zombies in the final room but the door still wouldn’t open, so I had to noclip in order to pass. If you have 10 minutes to spare then it’s worth playing. Mod from the author of Chaos Theory. In that mod, there was a dark place with lightning and crowds of zombies. After the Chaos Theory the author decided to further develop that idea, and made the map Aftermath, where due to horrible incident everyone around us turned into zombies. We venture through the mountains and buildings which are built in these mountains. Once or twice we’ll have to ponder in search for a way to progress. This time the zombies scare not with their quantity, but with their ability to sneak to us and attack suddenly. 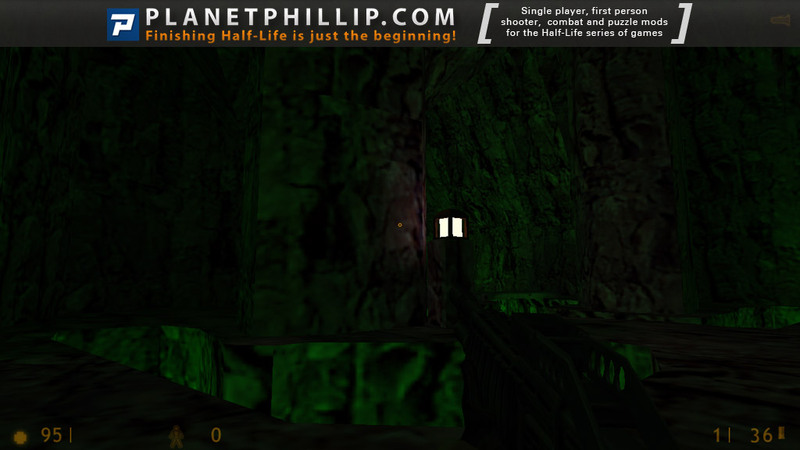 The ambient sounds were picked to create horror atmosphere. All in all it’s a good map. Can someone please tell me WTF I’ve just played or more accurately endured? (thankfully only for a short time). I played this twice, the first time normally and the second time with cheats in case I was missing something, I wasn’t. This could have been a small section of a bigger map in which case you probably would not even notice or remember it, but as a stand alone it was BORING! OK, what it was, was a shoot zombies, nothing more nothing less. If you have 10 minutes to spare then go and watch paint dry. Well, Aftermath is a decent although simple horror-style map. It’s from Stuart Maine (MrBunwah) who was a map reviewer for Z-Axis back in the day and put together the wonderful MrBunwah’s Guide To Achieving A Perfect Single Player Review Score. Aftermath isn’t hard and it isn’t long, and it serves as more of a proof-of-concept or demo for a great atmosphere. What’s here is nicely designed but not very fun to play, although it’s probably worth the download and the time. Bottom line: you get 3 good weapons, and get to shoot zombies and headcrabs in a good horror atmosphere for about 10-15 minutes. I felt this quite a bit simple and where the central element is a basic puzzle where the main ennemy is the zombie and a few headcrabs, the whole map is darky and the strongest point of this map is the environment element it has, darky and radioactive, the guy here said he was trying to create a spooky element, which I think he doesn’t reach at all, I mean maybe zombies were spooky back in 1998 but 12 after they are not…..
Do yourself a favor and jump in the toxic waste. 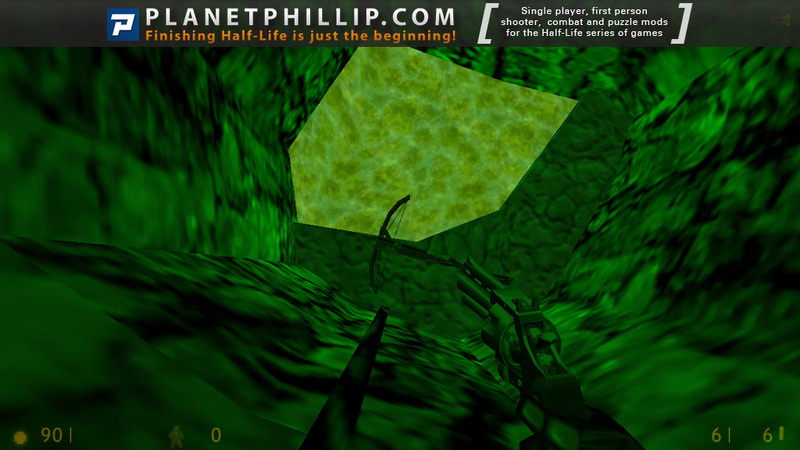 Toxic wasteland style survivor map with dark scenery and tension-creating flair. -Gets boring fast somehow, unfortunately..
Like Neil Manke’s excellent They Hunger, Aftermath is designed as a spookfest. Unlike They Hunger though, the setting has a more realistic touch. Whereas They Hunger featured creepy “modified” monsters out in the country, this one is a lot closer to the home that is Black Mesa. To be more accurate, maybe the canyons near Black Mesa. The lighting (or lack thereof) makes it hard to see much, so you’d best play in complete darkness, but gameplay is a real creepy treat. 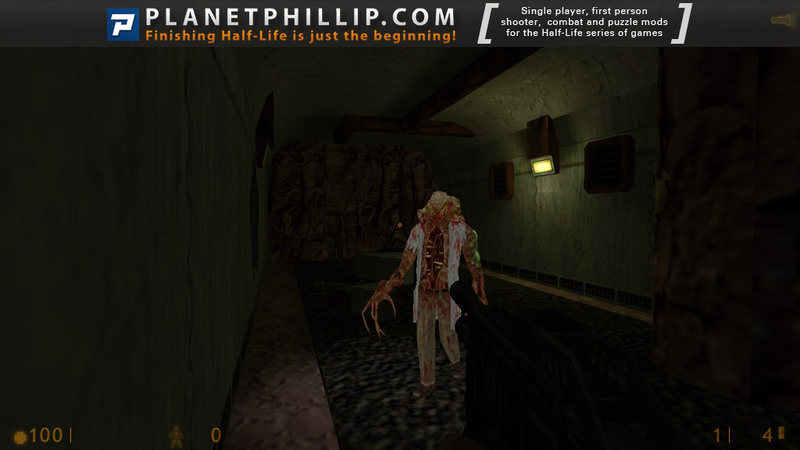 Using the zombie’s and headcrab’s natural Half-Life idle sounds seems to be more effective than lame monolog such as “Brains! Flesh!” Couple that with flashes of lightning and thunderclaps (which, by the way, should have been more infrequent to improve the effect). The author intelligently gives you only the .357 Magnum, shotgun, and crossbow (sufficient, really) and just enough ammo to dispatch the enemies with aplomb, yet given the nature of these weapons’ reload mechanisms, gameplay is intense all the way through and finishes off with a brutal, challenging set-piece. Suffice it to say that this is the sort of gameplay that should have been consistent in the They Hunger trilogy. Level design is, in a word, excellent and complements the gameplay to great effect. Architecture is convincing story-wise (click the above link for the story) and there’s good attention to detail, even outdoors. There are also some good puzzles that make sense and fit in with gameplay. 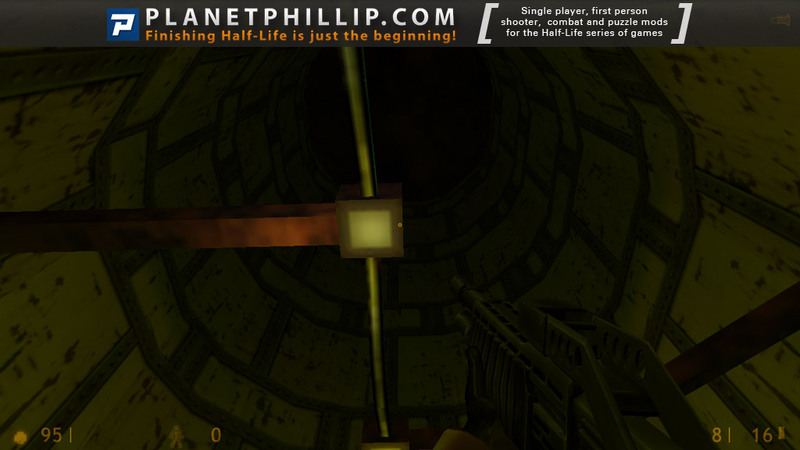 And Half-Life’s CD music is used well too! It’s a testament to the quality of this release when I can only say that I was sorry it ended. With superbly crafted atmosphere and gameplay, Aftermath is very good indeed and a real surprise at only 1 map. For that, this map easily earns the Ten Four Silver. This review is republished here by permission and was originally published Tuesday, 29th October, 2002 by Calyst. This mod is good, and for what it is, it’s great but there are quite some flaws here. First of all, the enemies. The enemies are zombies, headcrabs, and that’s it. You get the idea, it gets tiring really fast. Second, the weapons. There are only 3 weapons you can use. The Magnum, the Shotgun and the Crossbow. The Magnum and the Crossbow are completely useless, making this even more tiring. Also, there are a lot of headcrabs, so a crowbar would really be nice. Now, more on the positive side, this mod does manage to get creepy later at some point, but it ends up being too dark, making enemies hard to see. I just noticed, the author that made this mod is the author that made The Chaos Theory. And, as EmoLevelDesigner said, there was an area on that mod with a creepy lightning effect and a creepy atmosphere. The lightning effect returns in this mod, and it’s as good. Also, the maps look a bit too similar to each other, but I don’t really mind. Overall, this mod is not anything original, but it’s done well. If some of its flaws were fixed, and it was longer, this could have been much better.